U.S. intelligence analysts have concluded al Qaeda has rebuilt its operating capability to a level not seen since just before the Sept. 11 terrorist attacks, The Associated Press has learned. A counterterrorism official familiar with a five-page summary of the new government threat assessment called it a stark appraisal that will be discussed at the White House on Thursday as part of a broader meeting on an upcoming National Intelligence Estimate. Counterterrorism analysts produced the document, titled "Al Qaeda better positioned to strike the West." The document pays special heed to the terror group's safe haven in Pakistan and makes a range of observations about the threat posed to the United States and its allies, officials said. Al Qaeda is "considerably operationally stronger than a year ago" and has "regrouped to an extent not seen since 2001," the official said, paraphrasing the report's conclusions. "They are showing greater and greater ability to plan attacks in Europe and the United States." John Kringen, who heads the CIA's analysis directorate, echoed the concerns about al Qaeda's resurgence during testimony and conversations with reporters at a House Armed Services Committee hearing on Wednesday. The threat assessment comes as the National Intelligence Council is preparing a National Intelligence Estimate focusing on threats to the United States. A senior intelligence official, who spoke on condition of anonymity while the high-level analysis was being finalized, said the document has been in the works for roughly two years. Kringen and aides to National Intelligence Director Mike McConnell would not comment on the details of that analysis. "Preparation of the estimate is not a response to any specific threat," McConnell's spokesman Ross Feinstein said, adding that it would be ready for distribution this summer. Counterterrorism officials have been increasingly concerned about al Qaeda's recent operations. 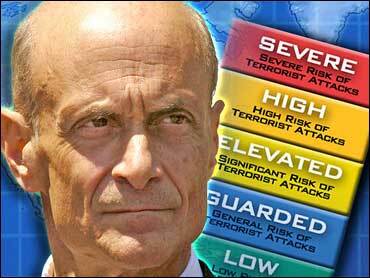 This week, Homeland Security Secretary Michael Chertoff said he had a "gut feeling" that the United States faced a heightened risk of attack this summer. CBS News chief Washington correspondent Bob Schieffer explained that Chertoff will face a "fierce reaction" from Democrats if his warning is fueled by more than a "gut feeling." In 2005, London faced two separate sets of transit attacks. The July 7 attacks on three trains and a bus killed 52. A second attack on July 21 was bungled when the detonators failed to light the explosives. Last summer, international counterterror authorities said they foiled a plot to use liquid explosives to take down roughly 10 U.S.-bound airliners leaving Britain. Kringen said he wouldn't attach a summer timeframe to the concern. In studying the threat, he said he begins with the premise that al Qaeda would consider attacking the U.S. a "home run hit" and that the easiest way to get into the United States would be through Europe. "Sooner or later you have to quit permitting them to have a safe haven" along the Afghan-Pakistani border, he told the House committee. "At the end of the day, when we have had success, it is when you've been able to get them worried about who was informing on them, get them worried about who was coming after them." The Bush administration has repeatedly cited al Qaeda as a key justification for continuing the fight in Iraq. "The number one enemy in Iraq is al Qaeda. Al Qaeda continues to be the chief organizer of mayhem within Iraq, the chief organization for killing innocent Iraqis," White House press secretary Tony Snow said Wednesday. The findings could bolster the president's hand at a moment when support on Capitol Hill for the war is eroding and the administration is struggling to defend its decision for a military buildup in Iraq. A progress report that the White House is releasing to Congress this week is expected to indicate scant progress on the political and military benchmarks set for Iraq. The threat assessment says that al Qaeda stepped up efforts to "improve its core operational capability" in late 2004 but did not succeed until December of 2006 after the Pakistani government signed a peace agreement with tribal leaders that effectively removed government military presence from the northwest frontier with Afghanistan. The agreement allows Taliban and al Qaeda operatives to move across the border with impunity and establish and run training centers, the report says, according to the official. It also says that al Qaeda is particularly interested in building up the numbers in its middle ranks, or operational positions, so there is not as great a lag in attacks when such people are killed. "Being No. 3 in al Qaeda is a bad job. We regularly get to the No. 3 person," Tom Fingar, the top U.S. intelligence analyst, told the House panel. The counterterror official said the report does not focus on Osama bin Laden, his whereabouts or his role in al Qaeda. Officials say the network has become more like a "family-oriented" mob organization with leadership roles in cells and other groups being handed from father to son, or cousin to uncle. Yet bin Laden's whereabouts are still of great interest to intelligence agencies. Although he has not been heard from for some time, Kringen said officials believe he is still alive and living under the protection of tribal leaders in the border area. Armed Services Committee members expressed frustration that more was not being done to get bin Laden and tamp down activity in the tribal areas. The senior intelligence analysts tried to portray the difficulty of operating in the area, despite a $25 million bounty on the head of bin Laden and his top deputy. "They are in an environment that is more hostile to us than it is to al Qaeda," Fingar said.